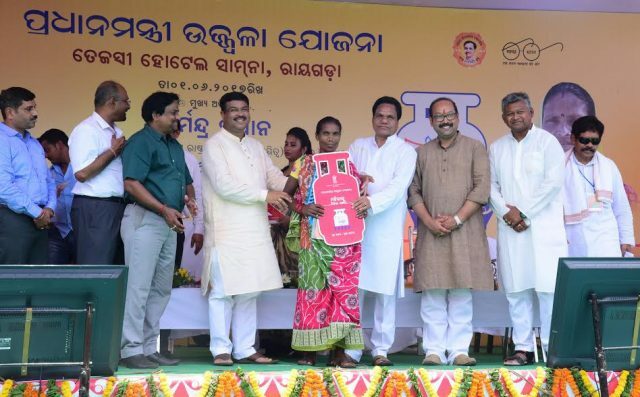 Rayagada: Union Petroleum and Natural Gas Minister Shri Dharmendra Pradhan distributed free LPG connections to 1000 poor households under Prime Minister Ujjwala Yojna (PMUY) in Rayagada district today. Addressing a public meeting he said that, my aim is to reach more 1 lakh households on account of new LPG connections in this district. 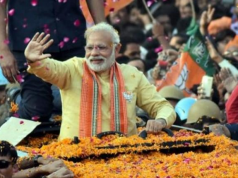 Shri Pradhan told that, under PMUY, any person who listed in SECC list based on Social-Economic Cast Census 2011 is eligible to get new LPG connection in free of cost and the connection will be given in the name of women of the family. 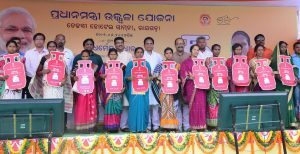 According to this list, 1,20,000 households of Rayagada district are eligible to get benefit of this scheme and to get new gas connections under Ujjwala Yojna. Shri Pradhan told that, in last one year 17,000 poor women of this district have been benefitted under Ujjwala Yojna. Adding to this, Shri Pradhan told that, poor don’t have any party. Support is required to help poor people to fight against poverty. In last panchayats election, if people’s representatives including ward members, Samiti members, Sarpanch, Zilla Parishad Members, Central and State Government employees, and district administration come forward to create public awareness, in next one and half year 1 lakh more households will definitely get new gas connections. In his speech, Shri Pradhan requested the women who were present in the meeting to avail free gas connections and safe their health instead of doing hard labour and going to forest to collect fuel for cooking. 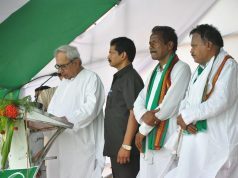 He also said that, for the development of Rayagada district, it is necessary to stop forest cutting and safe health condition of women, children and senior citizens from smoke emitted from burning of fire during cooking. For this, Modi’s Ujjwala Yojna needs to reach every household of the country. Shri Pradhan added, 15 distribution centres are working in Rayagada district. 10 more are to be added very soon. 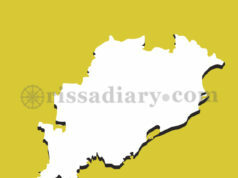 It has been planned to open a bottling plant in the district also.